The ZAV-48 Frostraven is a theoretical aircraft design by the Smart AI Serina. The ZAV-48 Frostraven is a conjectural design that pairs research work Serina conducted on weaponized vacuum energy cryotech with a modified EV-44 Nightingale airframe. By 2559, Isabel continues to review and integrate the knowledge left behind by Serina, but because Ellen Anders was focused on unraveling the secrets of the Forerunners, it is unlikely the Frostraven could pass from theory to prototype. The Frostraven is a unit unique to Serina. In order to unlock Frostravens, the player must spend a leader point on the passive leader power simply dubbed "Frostraven", Frostravens will then be available for purchasing at the player's firebase. The Frostraven's only upgrade improves its Cryo Projector to freeze enemies faster. The Frostraven's ability fires a Seismic Missile which instantly kills frozen units. Frostravens perform poorly against infantry, vehicles, aircraft, and structures, as it is a support unit. In Blitz, the Frostraven costs 70 energy, and the Seismic Missile is replaced with a Shockwave Missile which deals damage, freezes enemies, and also shatters frozen enemies. 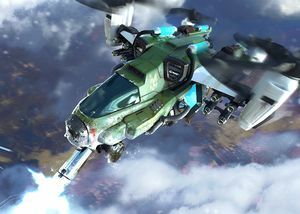 As an aircraft that utilizes cryo technology to freeze enemies and shatter them to pieces, Frostraven's role is similar to the Allied Cryocopter from Red Alert 3. A ZAV-48 Frostraven in Halo Wars 2. Two ZAV-48 Frostravens on Bedrock. A ZAV-48 Frostraven in comparison to a EV-44 Nightingale. Frostravens freezing a M121 Jackrabbit.